Planning a family vacation to Germany? Berlin is a wonderful city to explore, both for kids and the young at heart. The city's reputation for über-hip clubs and rough edges misses the fact that it also has lots of fun activities to make the whole family happy. Here are the best family-friendly things to do in Berlin from zoos to beaches and playgrounds to boat trips to festivals and museums. Your kinder will love Berlin, and so will you. A visit to the Berlin Zoo is the perfect activity for the whole family. It is the oldest zoo in Germany and proud to present the world's largest number of species. Every visit you are guaranteed to see loads of animals with the gleaming emblems of companies around EuropaCenter hanging overhead in this intercity zoo. The iconic Elefantentor (elephant gate) welcomes visitors to the zoo and attractions like the hippopotamus aquarium, panda enclosure, and sprawling aviary are a highlight. There are also several different themed playgrounds for kids to play and climb. Also on site is the small aquarium. Visitors can buy combination tickets, or even combination tickets with these two attractions and the former East Berlin Zoo, Tierpark. The Tiergarten is Berlin's biggest park and a great place to let your kids run free. Explore more than 600 acres, rent a paddle boat on the lake, find hidden bridges, and walk overgrown paths. 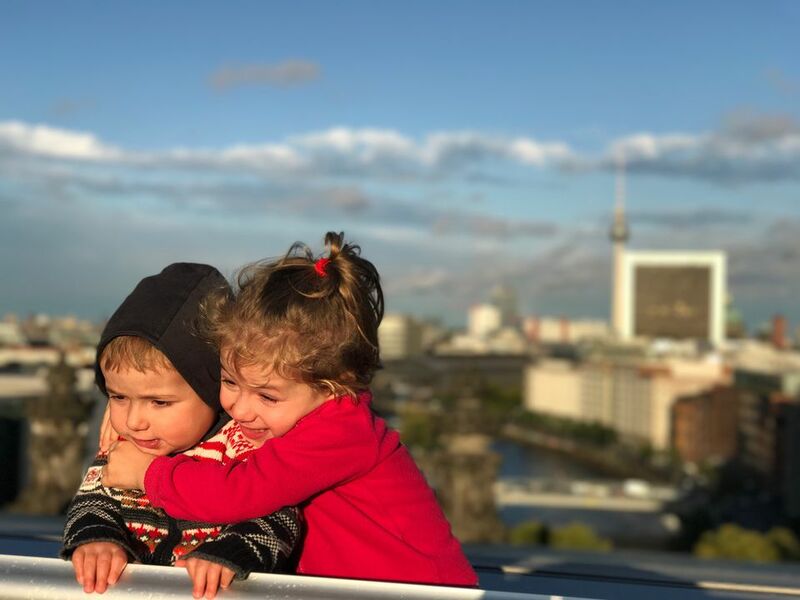 For one of the best views in the city, send the kids up the many stairs of the Victory Column and relish in their exhaustion afterwards by actually enjoying a relaxing beer at and snack at one of Berlin's best biergartens, Café am Neuen See. Located in the middle of the park, this beer garden is a great place for kids. Kollwitzplatz, in the heart of family-friendly Prenzlauer Berg, is the site of many playgrounds, kid-oriented shops, and a lovely farmers' market. Cafes and ice-cream parlors abound around Kollwitzplatz. If you come here on Wednesday or Saturday morning, sample organic goodies at Ökomarkt, the local farmers market. A great rainy day option is the German Museum for Technology (Deutsches Technikmuseum). You can't miss it, it has a real airplane sitting on top of its roof visible from the S-Bahn. Your kids will be enthralled by 14 different exhibition departments, featuring locomotives, airplanes, engines, ships, and much more. Almost every department offers engaging activities – kids can print or make their own paper and climb into a model mine shaft. The museum also offers an interesting audio tour especially designed for kids (also in English). Don't forget to explore the outdoors where you can see the old Anhalter Bahnhof (train station), observe a functional water mill, walk along wind mills and check out the traditional beer brewing process. Another great rainy day activity in Berlin is Potsdamer Platz with its shiny modern architecture and the impressive dome of the Sony Center. With its many events and programs throughout the year, it is always good to pass through. Plus it has fun places to visit, with movie theatres, stores, restaurants, and a film museum. The biggest attraction for young visitors is the indoor theme park, Legoland. Marvel at a miniature Berlin, built with 1.5 million Lego bricks, and enjoy fun rides and adventure trails made completely out of Lego. The park also offers plenty of space for children to get creative and to build their own Lego masterpiece. Your kids are tired from walking around, but there is still more of Berlin that you want to see? Take your family on a boat tour through Berlin's historic city center and watch the landmarks glide past as you drift down the River Spree. A boat tour is a wonderful experience on a Berlin summer day, but you can also take the tour when it rains; sit inside, have a hot chocolate, and enjoy the sights through the panoramic glass windows. Hop on a boat at Museums Island, where many different tours are offered (45-60 minutes).